It was very cold last week. COLD. And I'm old. Shut up. We have a fleece blanket downstairs in the kitty room. And Sam, our last cat, is over 18. At night we offer to let him burrow into his fleece cave. Dr. Phil, I tend to agree. 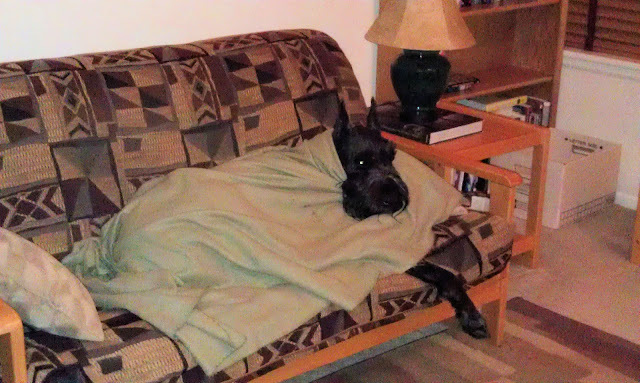 Now that Boogie is a geriatric dog, there's nothing he likes more than being "tucked in" on a very cold night. maybe knit him a snuggie? Thordr, my spoilage has limits. Given his heritage, the wolfie has never been interested in blankets over his superior cold-weather coat. But he does like to snuggle when it's cold, and sleeps on the bed wedged between me and Nick. The cat likes it under the covers when it's cold, though it hasn't been sufficiently chilly for that yet.